Portland cement variability can occasionally cause problems. "Are all nominally similar cements the same?" "Does cement from the same source (same cement works, same kiln) always behave consistently?" That said, let us first look at the other side of the coin. Consider a modern cement works - it probably produces 1000 - 4000 tons of cement a day. Raw materials are dug from the ground and are intrinsically variable - limestone from one end of the quarry might well contain more clay or silica than limestone from the other end for example. Fuels are variable - coal varies in ash and sulfur contents and these days, a works may also burn ancillary fuels such as solvents or car tyres. Variation in raw materials and fuels are likely to result in changes in kiln conditions and consequently, to some extent at least, to changes in the cement. Of course, some changes may be for the better, but unless they are maintained consistently, the result will be variability in the product. The short answer is that modern cement is normally more consistent and of a higher quality than ever before. This is due to more rigorous testing of the final product, by online analysis of raw materials and clinker and by improved monitoring of kilns, mills etc.. Of course, all this has been made possible by the advances in computer technology in recent years. For example, until fairly recently, chemical analysis would be done by conventional wet chemical analysis. A sample of clinker or raw material would arrive at the laboratory and over the following few hours a chemist would have crushed it, dissolved it, heated it, titrated it and do whatever else was required by the analytical method. For each element. In a modern works this is automated; a robot arm grabs the sample, crushes it, presses it into a pellet and analyses it by X-ray fluorescence and reports the result in less time than the chemist could determine one single element. Consequently, if the composition of the raw materials, or the clinker, starts to deviate from the target, corrective action can be taken quickly, not some hours later or maybe the next day as was once the case. The result is that cement is now much less variable. Despite all this progress, cement does still vary and, despite constant improvements, it probably always will. Below, we will consider some of the causes of this variability. The most important property of Portland cement that is likely to vary, is the strength of concrete produced from it. Other important properties are setting times and workability (which may also impact on strength if more water is added to the mix) and colour. Why might cement be different this week from the cement obtained from the same source last week? Cement made on a Monday is unlikely to be exactly the same as cement made at the same place on Thursday, but the chances are good that any differences will be insignificant. Sometimes, though, differences are greater. Cement-induced concrete strength variability can be due to both physical and chemical causes. Some of the more important causes are discussed below, although there are many others. In any reaction, a finer material is likely to react more quickly than a coarser material and cement is no exception. Differences in cement particle size, expressed as fineness or surface area, will affect strength development. If a cement has a different particle size, there will evidently be no point in looking at the cement composition for the cause if a problem has arisen with the cement mill. The fineness to which the cement is ground will evidently affect the rate at which concrete strengths increase after mixing. Grinding the cement more finely will result in a more rapid increase in strength. Fineness is often expressed in terms of total particle surface area, eg: 400 square metres per kilogram. However, of as much, if not more, importance as fineness is the particle size distribution of the cement; relying simply on surface area measurements can be misleading. Some minerals, gypsum for example, can sometimes grind preferentially producing cement with a high surface area, but very fine gypsum and relatively coarse clinker particles. Strength gain won't be as fast as expected; indeed, there could be false-setting problems. Grinding the cement more finely is likely to be the immediate response of a cement producer if he sees early strengths starting to decrease. Alite is the most reactive cement mineral that contributes significantly to concrete strength, so a higher alite content should give better early strengths ('early' in this context means up to about 7 days). Normally this is so, but not necessarily, as much depends on burning conditions in the kiln. Generally, more alite is good from the viewpoint of early strengths. However, it is possible that lighter burning of a particular clinker could result in cement giving a higher early strength due to the formation of more reactive alite, even if there is a little less of it. Not all alite is created equal! Large alite crystals are generally less-reactive than smaller ones. Kiln conditions leading to large alite crystals are therefore likely to produce clinker that will result in lower early strengths in the cement. Such kiln conditions are likely to be a slow rate of heating of the clinker in the kiln or prolonged burning at high temperature. Slow cooling of the clinker may also cause the alite to be less-reactive. For a particular cement, there will be what is called an 'optimum sulfate content,' or 'optimum gypsum content.' Sulfate in cement, both the clinker sulfate and added gypsum, retards the hydration of the aluminate phase. If there is insufficient sulfate, a flash set may occur; conversely, too much sulfate can cause false-setting. The solubility of the sulfate, and therefore its availability to produce retardation or to cause a false set (also known as 'plaster set') depends on the starting materials used and the temperature in the cement mill. A balance is therefore required between the ability of the main clinker minerals, particularly the aluminate phase, to react with sulfates in the early stages after mixing and the ability of the cement to supply the sulfate. The optimum sulfate content will be affected by many factors, including aluminate content, aluminate crystal size, aluminate reactivity, solubilities of the different sources of sulfate, sulfate particle sizes, milling temperatures and whether admixtures are used. If this were not complicated enough, the amount of sulfate necessary to optimize one property, strength for example, may not be the same as that required to optimize other properties such as drying shrinkage. Additionally, concrete and mortar may have different optimum sulfate contents. It is thought that sulfates affect strength development by influencing the microstructure of the calcium silicate hydrates, although the details of this are unclear. More straightforward is the concept that sulfates affect workability. Concrete is normally made to a given 'slump' and not to a fixed water/cement ratio. If the sulfate content deviates from the optimum, the workability will be reduced and more water will probably be added to the mix. This will result in lower strengths at all ages. Much of the clinker sulfate is present as alkali sulfate, usually in the form of aphthitalite (Na2SO4), arcanite (K2SO4) or calcium langbeinite (2CaO.K2O.SO3) , or a mixture of some or all of these. Sodium and potassium sulfates can affect strength development by increasing the alkalinity of the pore fluid; when a sulfate ion reacts with aluminate phase to make ettringite and is removed from solution, the loss of the sulfate ion is balanced by the creation of two hydroxyl ions. This increased alkalinity accelerates alite hydration, giving higher early strengths. 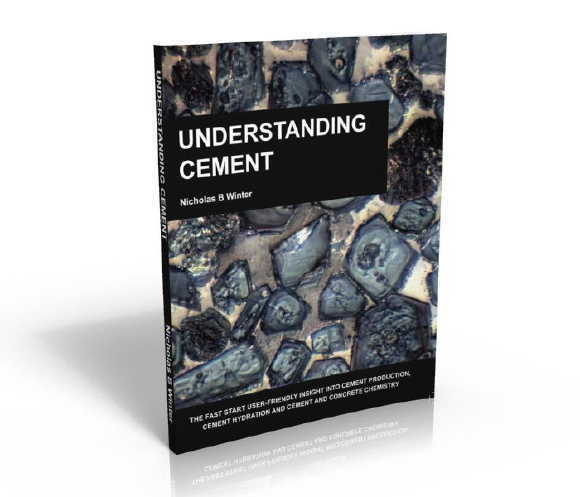 We have here touched on some of the ways in which cement variability can affect concrete strength development but it is a complex subject and by no means fully understood.